Longtime readers may find this subject familiar, as I’ve written not one but two blog posts on these same two butterflies in the past. I’ve seen two recent blog posts on the beautiful fall-blooming wildflower Fringed Gentian, one from Julie Zickefoose and one from Jim McCormac. Why did I never run into these when I lived back east? There’s a partial solar eclipse tomorrow (Thursday)! Cool but eerie – listen as the birds in a forest in California fall silent over a period of several years. Any other cool nature- or wildlife-related links I should add? Share in the comments! I Met a Famous Porcupine! This video has had over two million views. 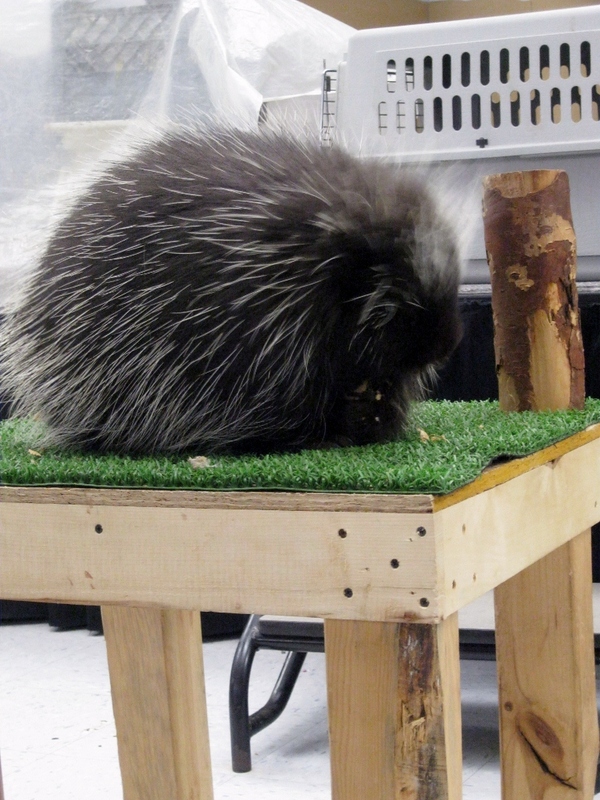 This porcupine, whose name is Thistle, definitely qualifies as internet famous. And this week I met this famous porcupine in person! Turns out Thistle is now an education animal at Wolf Ridge, the environmental learning center in northern Minnesota that my fellow grad students and I went on a field trip to. Here is a hastily-snapped photo of him, no longer a cute porcupet – yes, that is the real word for baby porcupine – but now a big fat grown-up porcupine. These days his treat of choice is peanuts. Just another day in the glamorous life of a naturalist, constantly rubbing elbows with celebrities. Author RebeccaPosted on Friday, January 18, 2013 Monday, March 25, 2013 Tags celebrity encounters, porcupines, video, wildlife7 Comments on I Met a Famous Porcupine! Over the weekend I hiked out to one of my favorite spots on campus, the same place where I photographed grass-pink orchids this summer and watched courting turtles last fall. It’s this amazing area along a lakeshore where old logs in the water have been colonized by bog plants, creating little islands of habitat. Getting out to them requires scrambling down a bank and then walking out on the newer vegetation-free logs. While I was crouching on a log admiring the sundew and pitcher plants, a meadowhawk dragonfly (I’m not sure of the exact species) blundered into a big spiderweb next to me. I admired it for a moment, thinking I might take a photo and then free it, since the spider seemed to be nowhere in sight. Then the dragonfly twitched and the enormous spider appeared out of its hiding place. After a second it occurred to me to switch my camera to video mode. Ta-da! I can almost hear David Attenborough narrating. You can see the spider working to crunch the awkwardly-shaped dragonfly down into a more manageable package, crumpling up its wings and abdomen. It was hard to keep the video perfectly in focus, since I was balancing on a log and couldn’t see what I was doing terribly well. But I’m not gonna lie, this was a pretty darn cool thing to watch. What a big meal for that spider! We visited the International Crane Foundation in Baraboo, Wisconsin yesterday. More on that later, but their captive Whooping Cranes were beating the heat by panting and splashing around in their pool. It was entertaining to watch such graceful birds let loose and act goofy. Whooping Cranes are the most endangered of the world’s crane species and one of the most endangered birds in North America – less than 500 remain in the wild. My coworker at my assistantship this semester just finished editing this video featuring both of us (and our friend Bob) for her web series, Cool Things in Nature. In addition to the return of my raspberry-colored coat and dorky hat, this features me talking (again) about fisher predation… and Julia telling you more than you ever really wanted to know about porcupine mating rituals. Author RebeccaPosted on Wednesday, March 7, 2012 Thursday, March 28, 2013 Tags television, video, work4 Comments on I’m on TV! A while ago I wrote about fishers, which were on my mind because I was preparing to give my final presentation for my Certified Interpretive Guide training, for which my topic was fishers and the fact that they’re the only predator that kills and eats porcupines. If anyone is interested in hearing me talk about fishers for ten minutes, here’s the video of that talk. It’s always disconcerting to see and hear oneself on video. I really look and sound like that? Oh well.